Shooters are main weapon classifications in Splatoon and Splatoon 2. Shooters are guns that fire small blobs of ink in quick succession. 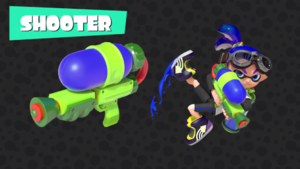 Blasters are shooters that are able to fire large globs of ink with a delayed explosion. The explosion allows users to attack opponents located behind obstacles or around corners. Most shooters are fully automatic, continuously firing when the player holds the trigger. Some have semi-automatic operation, requiring the player to tap the trigger repeatedly instead of holding it, and firing one bullet per tap. Some have burst-fire operation, requiring the player to tap the trigger repeatedly and firing multiple bullets per tap. Shooters are the only main weapon class to have each sub weapon represented at least once. The Rapid Blaster Pro Deco. Ammo Knights, Sheldon selling Shooters with a Shooter on the shelf at the back. Magazines at Ancho-V Games, with several Shooters at the bottom.